Home > News > Welcome to our new website! 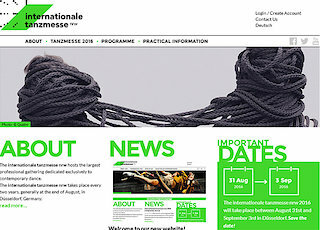 We are very excited to introduce you to the new website of internationale tanzmesse nrw! Designer Clinton Stringer has drawn inspiration from the Laban-Cube to create the new Tanzmesse logo. We have opted for a refreshing neon-green colour to complete the visual identity of internationale tanzmesse nrw 2016, but Tanzmesse’s colour changes every two years. In addition, the web development agency webandmore has reshaped our website from the ground up, with a focus on improving user navigation and reliability. The website includes helpful features to make reserving a booth much easier. For instance, Exhibitors are able to create their own online-account and personally manage the information about all the participants at their booth. Artists who have rented a booth and want to participate in the performance programme of internationale tanzmesse 2016 can submit a proposal online on our website for different presentation options: Performance Programme, Open Studio, site specific performances. We invite you to take a tour around the website. If you’d like to give us feedback, we’d love to hear what you think: info@tanzmesse.com.